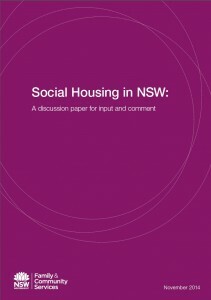 Social Housing in NSW discussion paper… what is not up for discussion? 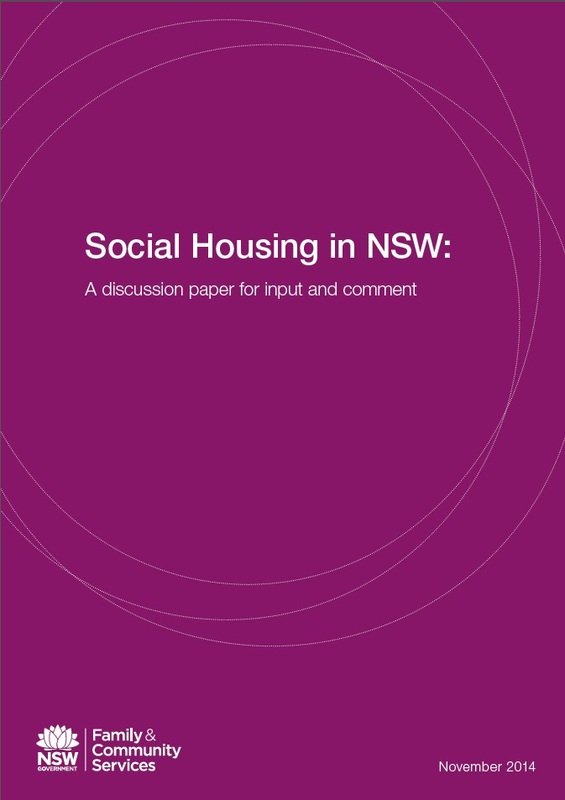 The NSW Government has produced a discussion paper on the future of social housing and is looking for feedback until 20 February 2015. Chris Martin explores some of the report’s assumptions. The major theme of the discussion paper is ‘providing opportunity and pathways for client independence’, particularly by ‘more actively supporting clients’ – particularly working age tenants, and young people – to ‘transition out of social housing’. Transitioning out of social housing means transitioning into private rental housing. The discussion paper, however, has hardly a word to say about private rental. But you cannot have a proper conversation about social housing – much less actually do any of the things the State Government says it wants to do to social housing – without also saying and doing something about private rental. 43 per cent – 94,959 households – were paying more than 50 per cent of their income in rent; that is, they were in ‘housing crisis’. 26 per cent say that their ‘family has sometimes gone without meals’. That’s just how private rental fails on cost; it also fails on security (about one in six tenancies end at the instigation of the landlord, and everyone is subject to termination without grounds at the end of their fixed term, or on three months’ notice otherwise); and it fails on consumer protection (according to the Tenants’ Union’s own survey, 79 per cent of private renters have put up with a problem, rather than assert their rights, because they feared adverse consequences). It is simply unreal to expect appreciable numbers of households in social housing to happily ‘transition’ into this. And we know this because Housing NSW already operates such a policy (it reviews tenancies for continuing eligibility at two, five or ten year periods), and has done for seven years. Over this time the rate of exits from public housing has declined. This policy has made matters worse for public housing tenants (who stay poor to stay housed) and for those on the waiting list (who are stuck longer in private rental, or homelessness). If the NSW State Government really wants to help those on the waiting list, and make ‘transitioning’ out of social housing a realistic prospect, it must discuss reforming the private rental market too. It should also be open to discussing increased funding for social housing, so that there’s more of it. Unfortunately, neither is this up for discussion in the paper, which is predicated on funding ‘within the existing envelope’. At a briefing on the discussion paper, FaCS Minister Gabrielle Upton was asked about the lack of reference to the private rental market and its problems. She replied that the policy levers for private rental reform were not within her grasp, but were instead with others in the State Government and, even more so, the Federal Government, and that rather than wait for any action from them, she just had to get on with it. That’s a fair point. But if the social housing policy that follows from the present discussion does not consider the reality of the private rental market, and how it fails low-income households, and how other government policies have shaped it that way, any initiatives for ‘opportunities and pathways’ out of social housing will only raise false hopes, or real fears. Dr Chris Martin is the Senior Policy Officer at Tenants’ Union of NSW. The above article is adapted from the TU’s blog – The Brown Couch – http://tunswblog.blogspot.com.au/. References to the documents referred to can be found in the online versions of this article. ISRCSD will hold a Community Forum on the paper on Wednesday 14th January 2015 – for more information see Community forum on the Social Housing in NSW Discussion Paper.